A design that is worthy of its name, our POLYWOOD Nautical Porch Chaise Lounge features a brilliant design that will make you feel like you are lying on a sandy beach, looking out at a peaceful ocean scenery at one of the finest resorts in the world. From the slatted seat to the adjustable reclining backrest, this chair is perfect for soaking up the sun on a beautiful summer day or kicking back to enjoy your favorite beverage and snacks with your friends and family. 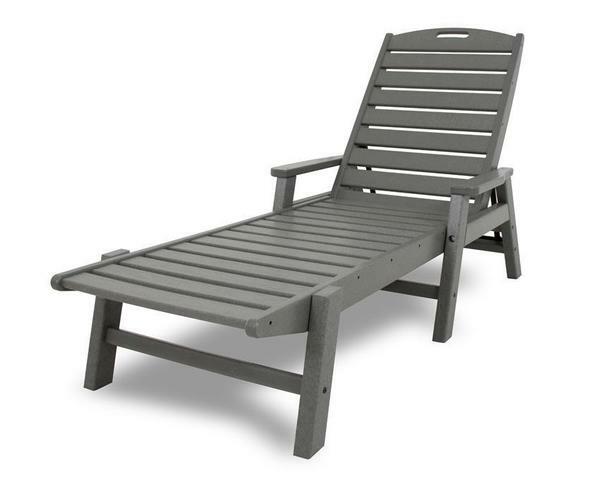 These stackable POLYWOOD chaise lounges are perfect for commercial use poolside or on the beach. Choose from seven vibrant colors to compliment your porch decor and your new chairs will be on their way in 3-5 days! Add the matching POLYWOOD Nautical Folding Side Table to complete the look and ensure you have a convenient place to rest your favorite snacks and a cool beverage while relaxing the day away. Like all pieces in our POLYWOOD Collection, these chaise lounge chairs are perfect for outdoor use. Made from recycled post-consumer plastics, these chairs can hold up to sun, rain and snow for decades! Perfect next to the sea, these chairs will not weather from the salty air or chip, crack, splinter and rot from moisture. And, since they're backed by a handsome 20 year warranty, you can rest assured knowing your investment in your favorite outdoor oasis is one that will carry on for many years to come. Boxed Dimensions - 48" x 22" x 7"
Boxed Weight - 58 lbs.